Remember the Don Henley song, ‘ The Boys of Summer’? In appointments with clients around Memorial Day each year, nearly everyone talks about their worries of wearing less clothing and bathing suits in particular. Also at this time, nearly every media outlet – social media, emails, commercials on tv and radio – is programed for weight loss and your ‘best beachbody’ for weeks up until the official start of summer on June 21st. This got me thinking on what I refer to as ‘The Noise of Summer’. Last year I wrote about this topic as well (albeit with a nutrition science twist) and you can find that edition of my e-NL here. Comparing your body to anyone else leads to anxiety and low self esteem. You don’t know what someone else is eating, or not eating, or how much they use Photoshop. My body at 46 years old is certainly not the same as it was when I was 26 or 36. I’m not wearing the same clothes or bathing suits as I did at those ages. Keeping clothes or bathing suits from a young age to try to fit into them again is a Really. Bad. Idea. This is a form of ‘body checking’ and again leads to comparison, which leads to low self esteem (see #1!). Where gratitude is, comparison and negativity cannot exist. For me, I think of my body as strong – most of the time. Some days I feel less energy, therefore less strength, and this could be from a myriad of reasons – lots of stuff with our kids, in addition to work, the cats woke me up 3 nights in a row, or I’m more stressed out than usual – whatever the reason… But when I visualize my strong body and focus on this in the form of gratitude, guess what? I don’t hear any ‘summer noise’. Julie Duffy Dillon of the Love Food Podcast talks about the fears of binge eating on vacation on episode 35 here. Summer Innanen recorded this video on getting your ‘body ready for the summer’. 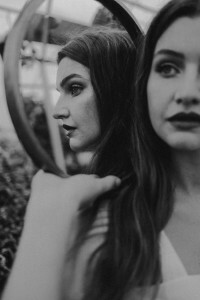 Natalie Joffe composed a post on GirlsGoneStrong.com called 5 Strategies to Cultivate Body Respect in a Thin-Privileged World. Alexis Conason posted as well calling her piece Getting Beach Body Ready. Lindy Shanti’s blog includes advice for dealing with your closet and warm weather clothing. Also, if you have not picked up this month’s issue of Self Magazine. Go get it, now. You can find Kevin Klatt’s post from this month’s issue on why diets fail here. Keep the entire issue for reference! Cheers to YOU this summer, not the ‘noise of summer’. What Color Is Your Body Image Today? Since I attended the Body Image Workshop with Marci Evans and Fiona Sutherland a few weeks ago I have been churning ideas, thoughts, and processes in my head non-stop. I’ve been wondering, ‘How do these thoughts all fit together and how can I apply them in my practice?’. 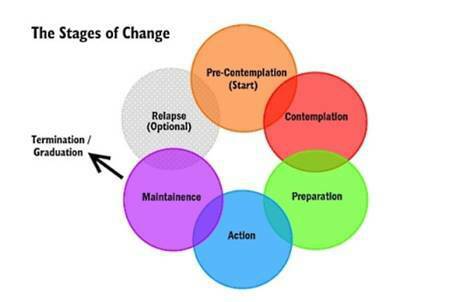 Both my dietetics and nurse practitioner training used the Stages of Change model. In dietetics school, I learned that it’s more about getting patients into a stage of action. In nursing/nurse practitioner school, we were taught to see patients in, and likely staying in, the precontemplation and contemplation stages. Can you see how being trained as both a dietitian and nurse practitioner would then be confusing in relating to patients? How does all of this relate to my practice now as well as body image? In addition to being trained as an action-minded clinician, I was also trained heavily in weight loss practices as a dietitian. This bothered me for a long time. Most of the clients I saw early on in my career had disordered eating and terrible body image even if they were meeting with me for weight loss. Sometimes our work together felt like it came to a standstill because I didn’t know how to help them get unstuck in hating their bodies. With this inkling in my head plus learning more from other clinicians on helping clients improve body image without getting stuck on their weight, my practice has shifted – greatly. I don’t see clients for weight loss anymore. We do talk about, when and if appropriate, weight, the scale, weight history, past ‘diets’ and certainly the latest diet trends for many reasons. Clients and patients come to see me because the work we do is around learning to eat and enjoy food and accepting and learning how to improve body image. Some of these clients are also athletes – hard stuff a lot of the time. The cool thing is body image does not always have to be the same every second of every day. We’re human, right? One day you might think, ‘I feel great about my body’ while the next you may think, ‘It’s hard to have a body today’. Please don’t stop reading if I’ve totally confused you or you’re 1000% in love with yourself all the time ;). Many of us internalize messages starting at a young age that can lead to either positive or negative body image. Having a healthy body image is an important part of mental well-being and eating disorder prevention. As a mom and a step-mom to four kids, I want them ALL to have the best body image and relationship with food possible – in addition to all of my clients and patients. The idea of expanding on colors and body image came to me when I was in the Body Image Workshop and we were reviewing the beginning subject matter. The hosts, Marci and Fiona, described ways we could share our thoughts in terms of colors. They equated a safe space to green, a brave space to yellow, and an unsafe space to red. As we moved through the workshop I continued to wonder if using more colors in my office with patients and clients could help them determine how they felt about their bodies in the present as well as learning how these colors shift and change. Colors are subjective in ways, in terms of the feelings we equate to them. For example, today I feel yellow about my body, because I’m headed to the beach for a few days with dear friends. Yellow is a kind and soothing color to me. Yesterday I felt red about my body because it was so hot and humid and I was in shorts for the first time all season. I also had way too much to get done and I could not move fast enough. When I was younger I often felt dark hues or black in relation to my body image because I thought I was fat – or worse – I would get fat from eating many foods – and according to the thoughts in my head this was very bad. Many pieces go into how we see our bodies – how we view them every day. Rainbow colors change and shift. So does body image. Relating to ourselves as human, with shifts and changes, and acknowledging that the body you had when you were 20 or 30 served you to get to 40, can be helpful as one gets even older. Even the stages of change image above is in colors of the rainbow indicative of shifts back and forth. What’s your body image color today? Is it different from yesterday? Has it shifted in the past few hours from purple to pink? Green to yellow? Or are you connected to the rainbow and your body image color shifts most days? Let me know if this resonates at all. I’d love to hear from you.